IntelliRec is a feature-rich, yet easy-to-use software video presentation developer. IntelliRec Screen Recorder lets you record one complete application/window including all the child windows. During recording if you move on to another application, the recording will pause and resume again when you get back on the application/window. IntelliRec is a screen recording software that lets you record your desktop screen activities for later playback. Any application that runs on your Windows PC can be recorded including applications with video and audio. You can create presentations from the screen recordings by adding your own audio narration. You can demonstrate how to use a web site or explain a software product usage. IntelliRec provides the ability to output your screen recordings Windows Media (WMV) format. You can make WMV files that are designed to be played from a streaming server and presented to large audiences over the Internet. 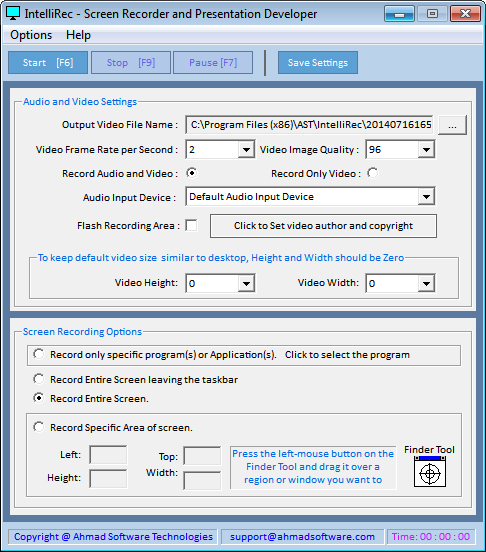 Record what happens on your screen and create to Windows Media (WMV) format. Record a recurring problem with your computer so you can show technical support people. Create software demos with video and audio. Create video bug report along with audio narration. Create video-based information products you can sell. Record new tricks and techniques you discover on your favorite software program, before you forget them. You can set recording frame rate per second. You can set recording video height and width. You can flash the recording area. IntelliRec lets you record one complete application/window including all the child windows. During recording if you move on to another application, the recording will pause and resume again when you get back on the application/window. For example: You are preparing video help for a new software 'ABC' . During its screen recording, you need to work on another application/window (i.e. MS Word) the recording will be paused automatically and resume when you get back on 'ABC'. As a result the final recording will be the 'ABC'. Record specific region in a window by just click. Record entire screen without taskbar. Minimum 10 MB of hard disk space on installation drive. What makes it Intelligent Screen Recorder? IntelliRec Screen Recorder lets you record one complete application/window including all the child windows. During recording if you move on to another application, the recording will pause and resume again when you get back on the application/window.